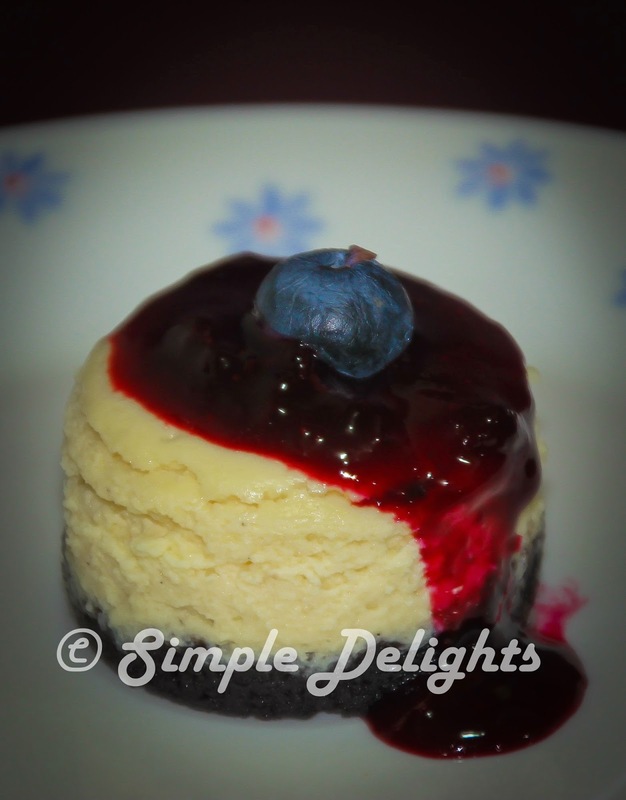 This is simple yet delicious cheesecake, is easy to make and the review will be great. I bought this mini cheesecake pan for quite awhile , have been wanted to make something beautiful from it. Before I attain to this recipe, I use this recipe to make tweak it to Orange Cheesecake , the result is equally yum . The recipe I used is the easy and no fail from ->Christine Recipe , she is my all time favourite food blogger , love the way she present her food and the step by step picture. It just make the baking easy and is no fail at all. 2. Pulse the Oreo biscuit to fine crumb using food processor and add the melted butter to combine well. 3. Divide the Oreo mixture evenly to 12 mini cheesecake pan. Is about 2 tablespoon for each small hole. Using the flat end of the rolling pin, lightly press the mixture and even the surface. 4.Combine the cream cheese and sugar in a mixing bowl. Use electric mixer to beat till smooth. Scrape down the side of the bowl to ensure even beating of the cream. 5. Add the egg in the cream mixture, beat well and follow by thicken cream , lemon juice and lemon zest. Beat till the mixture is smooth and well combined. 6.Spoon the cream cheese mixture over each Oreo biscuits evenly and bake in the preheated oven for 20min. 7. Once is bake well , take it out and cool at the wire rack . Carefully remove from the pan and chilled in the fridge. 1. Cook the blueberry with sugar and lemon juice in a small saucer pan with medium low heat. 2. When the blueberry started to turn soft , break it down and pour the cornflour water in bit by bit , stir well to combine till you get the right consistency. 3. Remove the compote from the heat and let it cool down and chilled in the fridge if you not serving immediately. Spoon the blueberry compote onto the cheesecake , it should have a small curve in the cake to let this compote sit well. Decorate with blueberry . I choose Cherry , it looks good on it and the taste yum . 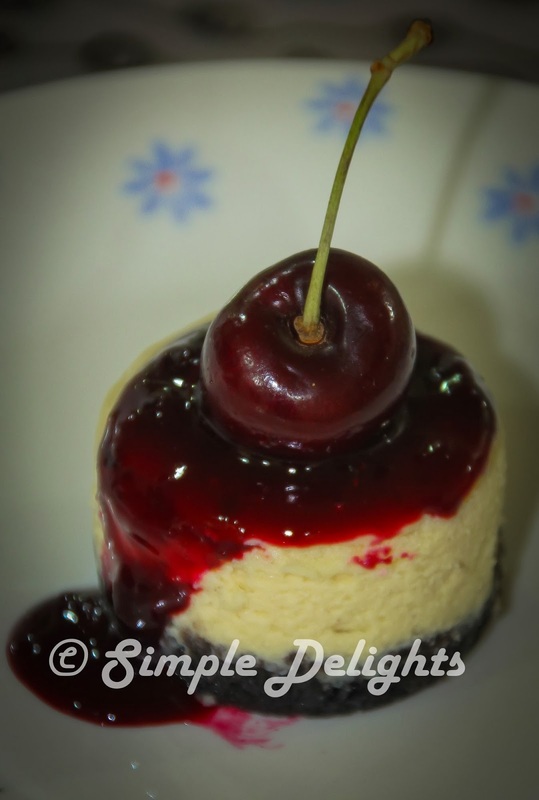 This mini cheesecake can be bake in cupcake as well.Top with any fruit you like or change the flavour according to your liking, it can be as surprise as a Valentine Treat. This is one of the dessert I brought to a Christmas party ^^.